Needs Supervision proved her big-figure Churchill optional claiming score last out in the slop was far from a fluke as she passed the class test with aplomb in Saturday’s Silverbulletday S. A second-out graduate at Laurel Nov. 2 after a runner-up debut at Penn National, she shipped down from trainer Jerry O’Dwyer’s Maryland base to air by five lengths and earn an 83 Beyer under the Twin Spires going a mile Nov. 24. Campaigned solely by Howling Pigeon Farms in her first two outings, she had been bought into by Gary Barber, Wachtel Stable and Madaket Stables since then. 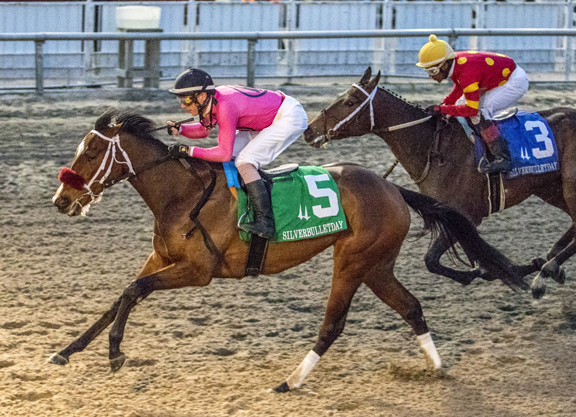 Tracking from third out in the clear, the second choice in the wagering asserted herself after six panels in 1:15.83 and ground out the victory from there. Longshot Eres Tu was second, while favored Grandaria was a far-back third. This was the first stakes victory for Needs Supervision’s young trainer and sixth black-type winner for her sire. The winner’s dam, a daughter of MSW Rose of Wendover (Brent’s Prince), has a 2-year-old Temple City filly who was picked up for just $10,000 as a Fasig-Tipton October yearling by Bryan Rice. After failing to get in foal to Kantharos during the 2017 breeding season, Moroccan Rose was bred back to Laugh Track last term. SILVERBULLETDAY S., $147,000, Fair Grounds, 1-19, 3yo, f, 1m 70y, 1:45.34, ft.
($22,000 Ylg ’17 KEESEP; $55,000 2yo ’18 EASMAY). Abraham (KY); T-Jeremiah O’Dwyer; J-Joseph Rocco, Jr.
$90,000. Lifetime Record: 4-3-1-0, $168,030. True. O-Edward A. Seltzer & Beverly S. Anderson; B-Edward A.
Seltzer & Beverly Anderson (KY); T-Steven M. Asmussen. 3–Grandaria, 122, f, 3, Curlin–Bagh of Jewelz, by A.P. Indy. B-CASA Farms I, LLC (KY); T-Brendan P. Walsh. $15,000. Margins: 3/4, 5 1/4, 2 3/4. Odds: 2.50, 31.20, 1.50. Also Ran: Liora, Cowgirls Like Us, Mandy Blue, Fun Finder. Click for the Equibase.com chart.